AccuShred, based in Toledo, Ohio, is a high-security data protection company that provides service to clients in Ohio, Michigan and Northeast Indiana. The company also offers a full range of EPA-Certified computer and E-Waste recycling services. AccuShred, the first AAA NAID Certified data destruction contractor in Northwest Ohio and Southeast Michigan, is a subsidiary of the State Paper & Metal Company, Inc., a well-respected family owned and operated brokerage and recycling firm that has provided its customers with more than 80 years of world-class service. Responding to the growing threat of information and identity theft, AccuShred has been strategically expanding its services and geographic area of coverage. AccuShred can expertly handle your company’s sensitive information. We offer a wide range of secure physical destruction services to our clientele, ranging from Fortune 500 companies to small local businesses and individuals. AccuShred also offers a data privacy self-assessment tool and award-winning data breach reporting service for small businesses. No job is too large or small. We provide our clients with both on-site and off-site scheduled container pick-up and purge services. We also invite clients who have a smaller amount of material, to drop their material off at our secure facility for a more cost-effective solution. AccuShred’s controlled access facility is equipped with a 24-hour state-of-the-art video surveillance system and monitored alarms. 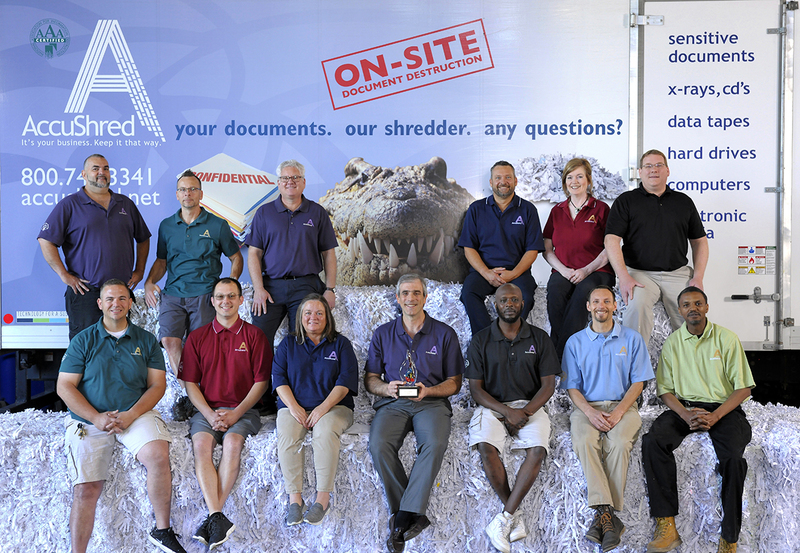 Our plant has the capacity to shred 8-10,000 pounds of documents and materials per hour into millions of 1/2″ pieces. AccuShred also offers solutions to our clients looking to destroy more than just paper. 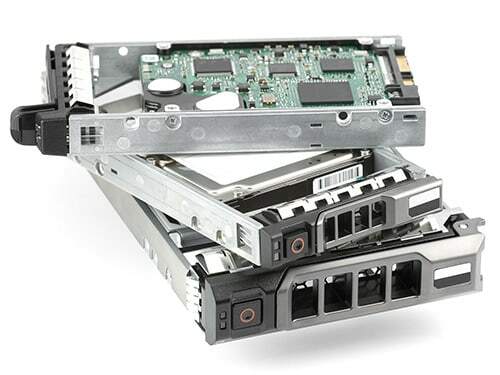 We tear down and completely recycle computers and other obsolete electronic equipment, and, most importantly, physically destroy (shred) every single hard drive entrusted to our care. We also destroy and recycle x-rays, microfilm, microfiche, uniforms and other sensitive unwanted products. AccuShred continually looks for ways to improve the level of service and protection that we provide our clients. We have added an additional level of security by becoming one of the first 30 firms in the United States to purchase Downstream Data Coverage, the most up-to-date and comprehensive professional liability insurance specifically designed to cover data destruction service providers and their clients. We also purchased new lockable containers with “fish guard” protection that provide a higher level of security, as well as new auto-locking truck door locks, which help to ensure an unbroken chain of custody. With identity theft and data breaches on the rise, AccuShred has expanded its commercial services to include the award-winning CSR Readiness® Pro suite of services. By offering CSR Readiness®, AccuShred provides small businesses with PROACTIVE self-assessments and prioritized remediation tasks to aid in the prevention of a possible security threat. If a data breach does occur, AccuShred’s patented CSR Breach Reporting Service™ (BRS) offers small businesses REACTIVE assistance by filing mandated breach reporting documents. If customer data is involved, CSR’s Breach Reporting Service™ will guide you through the onerous notification process. AccuShred prides itself on being a responsible corporate neighbor. We have partnered with local municipalities, corporations and the Better Business Bureau to provide free public shredding events. We also sponsor several community and non-profit events. Most recently, AccuShred has partnered with Susan G. Komen for the Cure of Northwest Ohio, developing the first-in-the-country ShredCancer Pink Bin program in order to raise awareness and funds for fighting breast cancer in our community. We have proudly raised, and donated, over $100,000 towards this very important cause. AccuShred is very proud and incredibly honored to have been chosen to receive a 2018 Better Business Bureau of Northwest Ohio and Southeast Michigan Torch Award for Ethics. This award shines a light on the practices that local organizations employ to generate a high level of trust among their employees, customers and community. The award embodies BBB’s mission of advancing marketplace trust. This award would never have been possible with the exceptional daily efforts of the entire staff. Every one of our employees contributed in some meaningful way to us receiving this prestigious award. Always tries to accommodate our needs, even at the busiest time of the year.